The titan of literature was speaking about the Arctic and her compulsion to return to it time and again with her husband and fellow naturalist, Graeme Gibson. Atwood and Gibson just completed their 17th Arctic cruise with Adventure Canada, the 30-year-old tour company that specializes in expeditions to remote parts of the world. 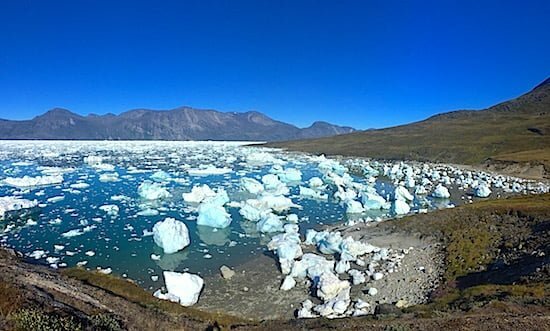 These included visits to two locations — southern West Digges Island in Nunavut and Kapisillit in Greenland — where Adventure Canada had never previously visited. The highlight for many passengers was a polar-bear encounter so stunning Atwood says it was one of the most incredible she had witnessed. Also compelling was a presentation Atwood delivered to passengers. Entitled “My Life as a Writer, 1939-Present”, the talk by the Booker Prize-winning author included details of her upbringing. Among the experiences she carries forward is an appreciation for nature, a trait gained from her parents who taught their children how to live off of the land and waters. Her passion for the world is exemplified in her adoration for the Arctic. Her explorations of the region have been an ongoing source of inspiration. The title story in the collection “Stone Mattress: Nine Wicked Tales” involves a murder that takes place on a cruise ship similar to the one Adventure Canada uses on its journeys. The novel, “Oryx & Crake”, features landscapes similar to the Arctic. 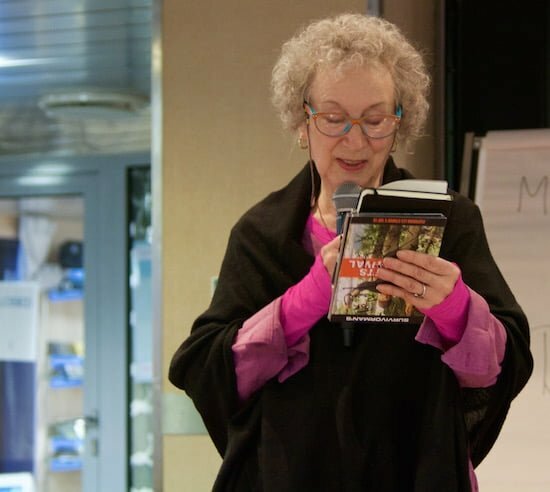 The author’s presentation also provided glimpses of Atwood’s current fame, sparked by the popularity of the TV series based on her 1985 novel, “The Handmaid’s Tale”. This fall, another one of her novels, “Alias Grace”, will receive the small-screen treatment as it will be serialized on Bravo. Like in episodic version of “The Handmaid’s Tale”, Atwood will have a cameo appearance. She revealed a photograph of herself in character and costume for the historical drama about an imprisoned woman in 19th-century Kingston, Ontario who may or may not have been guilty of murder. Between creative projects, Atwood travels. She and Gibson have travelled the globe for decades, and fondly recall how their daughter experienced it. 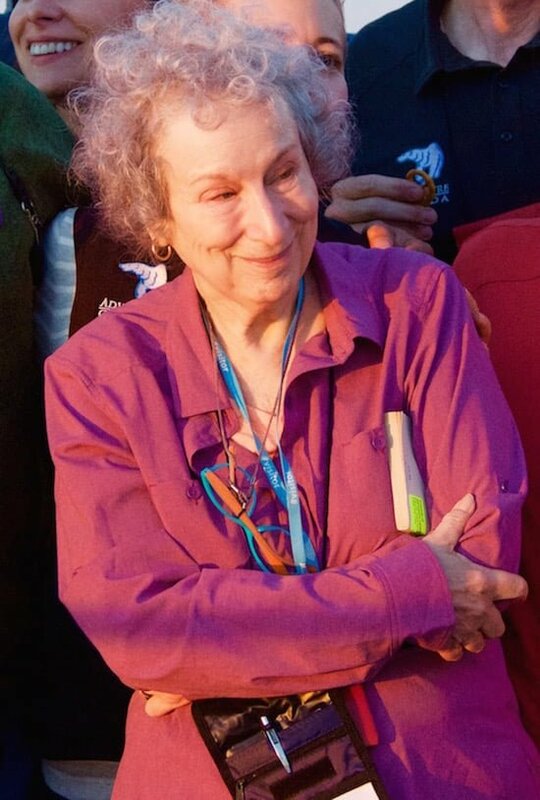 “When she learned to walk it was by climbing the steps of the Taj Mahal Palace at 18 months old,” Atwood says with a smile, recalling one of her daughter’s incredible childhood journeys. What’s next for Atwood and Gibson? They’re looking forward to a trip in March to Madagascar — a nation full of exotic wildlife — that no doubt will inspire the naturalist and writer in them both. Itinerary: The expedition includes a charter flight departing from Ottawa. The planned flight to Iqaluit had to be changed to Northern Quebec because of the accumulation of ice in Frobisher Bay, the location of the Nunavut capital. The 12-night cruise travels through the archipelago near southern Baffin Island, with stops at Inuit communities, Zodiac outings to view wildlife and scenery, and a range of extraordinary on-board programming that includes lectures from leading scientists and subject-matter experts. It culminates with multiple nights in Greenland, exploring its capital, Nuuk, and the spectacular landscape dominated by fjords and the nation’s immense icecap. Cost: 2017 Fares, including charter flights from Ottawa and back to Toronto at the end of the cruise, ranged from $6,190 to $17,790 USD.